Everyone has heard of the Daytona 500, the famed NASCAR event that takes place on the giant tri-oval, but Daytona International Speedway includes a versatile interior course that hosts an array of major events, including AMA races and the Rolex 24, as well as other schools and track days. With an incredible 31 degrees of banking in the oval, the horizon at this track appears almost vertical in some of the onboard motorcycle footage. Needless to say, this long road course configuration is a hair-raising venture with just about any vehicle. Successful navigation of the racing line at Daytona Speedway involves mastering two sections - the front section and the chicane. The front section begins with a tightening left-hander. Almost all drivers clip the inside of the track before running out to the right to set up for Turn 1, but the optimized lines all show that it is quicker to stay to the outside all the way until turn-in. Turns 2 and 3 can be taken just about flat-out, with some motorcycles needing to lift slightly. At Turn 4, it's very important to avoid turning in late from too far toward the left. The Miata stays out a bit wider than the other vehicles and clips the apex rather than hugging the inside. Turn 6 is similar to Turn 4, in that the Miata comes in from wider out than the other vehicles. That's mainly because it can take Turn 5 flat out, even sticking the left edge. The faster vehicles exit 5 wide to the right and stay close to the inside through 6, taking a bit of the double apex around the flat edge of the corner. Turn 7 is straightforward if you can remember where you want to exit the corner in relation to the second apex. Motorcycles will pretty much hit the apex, whereas faster cars will run wide of it. The Miata should also run a bit wide, but be going almost parallel to the track rather than driving toward the outer wall. After cruising through the huge banking at full throttle, you arrive at the chicane. This turn is critical for quick laps. The key for four-wheeled vehicles is that the line is dictated by taking apexes at 10, 11, and 13, but running just slightly wide of the apex at 12. Take Turn 11 at the highest possible speed and drive out hard through Turn 13. Motorcycles may or may not apex at 12, depending on the cornering limits. I'd then warn you not to forget to brake at the end of the humongous semi-straight that follows the chicane, but Turn 16 is a nice little reminder that you need to start driving again. Danny takes us for a wild ride around Daytona. There is a multi-car offroad excursion around 8:30, followed by a hilarious "drafting train" mega-pass at 9:05. More importantly, however, are the excellent lines and quality driving. Nice job, Danny! All the cars here take the inside line leading up to Turn 1, but I'd like to see if there were any advantage in a race situation to following Al's approach. One area where I think Danny loses valuable time is at Turn 7. He and many other drivers are focused on getting the best drive out of the corner, and they end up running too far wide through most of the turn. The disadvantage inherent in this approach is demonstrated at around 7:50 in the video, when the gray car takes a tighter line through the corner and pulls ahead by a significant margin. Lap times are around 2'23 in heavy traffic, which is very fast. I include this as a bit of a counterexample to the first clip in terms of driving style. With no offense meant to our dear friends Skunk Ape Racing, there is too much emphasis on setting up way to the outside and diving in toward the apex. Apexes need to be approached smoothly, with fluid transitions from braking to braking-while-steering to throttle-while-steering. The difference comes out in the lap times, which are around 6 seconds slower than in the previous video. No qualms with the overall approach, except for possibly cutting to the inside prior to Turn 1. 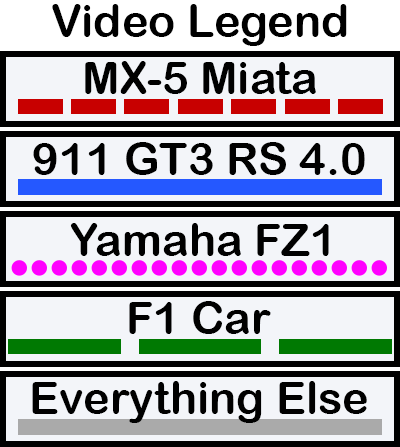 This lap is good for vehicles in the more middling power range. At first I was like, eh, Al did it faster in the GT3 RS, without any banking to help out. Then I remembered that they were on street tires. I guess that 1000+ pounds of downforce really does help! The race starts around 0:35, but I skipped ahead to when the traffic clears out a little (a very little). I clocked one lap at about 1'50, so yeah, that's fast. These cup cars regularly beat Al's times by a healthy margin. Note the tight lines around Turns 4 and 7 - the entry really isn't wide at all. Bit wide entering some of the turns. They sure do pound it down the big banking, though. Another good video for learning the leany way around Daytona. This rider also sadly suffers from entering-too-wide syndrome. A great piece of driving for the record-breaking lap. I love seeing the car slide around so gracefully for almost an entire lap - you really know it's being pushed to the limits.